Actin filament dynamics govern many key physiological processes from cell motility to tissue morphogenesis. A central feature of actin dynamics is the capacity of filaments to polymerize and depolymerize at their ends in response to cellular conditions. It is currently thought that filament kinetics can be described by a single rate constant for each end. In this study, using direct visualization of single actin filament elongation, we show that actin polymerization kinetics at both filament ends are strongly influenced by the binding of proteins to the lateral filament surface. We also show that the pointed-end has a non-elongating state that dominates the observed filament kinetic asymmetry. Estimates of flexibility as well as effects on fragmentation and growth suggest that the observed kinetic diversity arises from structural alteration. Tuning elongation kinetics by exploiting the malleability of the filament structure may be a ubiquitous mechanism to generate a rich variety of cellular actin dynamics. Actin is one of the most abundant proteins in cells. It forms networks of filaments that provide structural support and generate the forces needed for cell movement, division, and many other processes in cells. Filaments of actin continuously change in length as actin molecules are added or removed at the ends. One end of an actin filament—called the barbed-end—grows much faster than the other, known as the pointed-end. Many other proteins also help the actin filaments to form. Some of these proteins bind to the ends of the filaments, where they directly control the growth of the filaments. Other proteins bind along the length of the filaments, but how these ‘side-binding’ proteins influence the growth of filaments is not clear. In this study, Crevenna et al. used a technique called ‘total internal reflection fluorescence (TIRF) microscopy’ to study how several side-binding proteins affect the growth of actin filaments in an artificial system. The growth of the barbed-ends was strongly influenced by which side-binding protein was interacting with the filament. For example, the barbed-end grew rapidly when a protein called VASP was present but grew more slowly in the presence of the protein α-actinin. Although the growth at the pointed-end was generally slow and sporadic, the side-binding proteins also had noticeable effects. Crevenna et al. found that when the side-binding proteins were present at low levels, filament growth was similar for all proteins studied. It was only when the proteins were present at higher levels that the growth of the actin filaments was altered depending on the specific side-binding protein present. One side-binding protein called α-actinin also altered the shape of the actin filament so that when it was present at high levels, the filaments curved in a particular direction. Together, these results suggest that the growth, structure, and flexibility of actin filaments can be strongly influenced by the various proteins that bind along the length of the filaments. The next challenges are to understand the precise details of how these side-binding proteins are able to alter the growth and shape of actin and investigate how they influence other processes that control the structure of actin networks in cells. Central cellular processes such as cell migration, cytokinesis, endocytosis, and mechanosensation depend critically on actin-based force generation and actin filament turnover (Pollard and Borisy, 2003; Lecuit et al., 2011). The molecular basis of actin filament turnover derives from the association and dissociation of monomers from each filament end and depends on the nucleotide (ATP, ADP · Pi, or ADP) bound to the actin monomer (Pollard, 1986). The filament is kinetically asymmetric, where one end (called the barbed-end) is observed to grow an order of magnitude faster than the other end (the pointed-end) (Pollard, 1986). In addition, the critical concentration for polymerization is different for the two ends. The origin of the asymmetry is not fully understood. Measurements of filament elongation as a function of solution viscosity (Drenckhahn and Pollard, 1986) and particle-analysis from cryo-electron microscopy (Narita et al., 2011) suggest the existence of a non-elongating state at the pointed-end. Although growth pauses have been previously observed during filament elongation measured using total internal reflection fluorescence (TIRF) microscopy (Kuhn and Pollard, 2005; Fujiwara et al., 2007), these pauses were attributed to artifacts and were not characterized further. The dynamics of the pointed-end plays an important role in both the origin of the differences in critical concentration observed at the two ends in the presence of ATP (Pollard, 1986; Fujiwara et al., 2007); and in filament treadmilling, where, barbed-end growth and pointed-end shrinking occur simultaneously (Bugyi and Carlier, 2010). Thus, we have focused on performing an accurate and detailed analysis of both barbed-end and pointed-end dynamics using TIRF microscopy. In cells, a large number of proteins interact with actin filaments, either at the ends or with the lattice. End-binding proteins regulate actin dynamics by limiting elongation (at the barbed-end) or serving as anchor points (for the pointed-end). Side-binding proteins, on the other hand, are much more diverse encompassing myosin motors, cross-linkers or bundlers as well as severing proteins. The interaction of the actin filament with a particular subset of proteins defines the molecular composition, architecture, and overall turnover of sub-cellular arrays such as stress fibers and filopodia. Some of these arrays are tightly packed (Jasnin et al., 2013) and dynamics of the filaments are influenced by the local environment. The mechanisms of how some proteins are recruited to these structures while others are excluded are a subject of intense research (Cai et al., 2008; Hansen et al., 2013). Although the overall filament dynamics have been thought to be sensitive to the concentration of the side-binding protein (Breitsprecher et al., 2009), it is not understood how and to what extent side-binding proteins alter filament kinetics, structure, and flexibility. In this study, we used TIRF microscopy to study the effect of side-binding proteins on the dynamics of actin filament growth in vitro. We chose three cross-linking proteins and one motor protein to represent the large variety of interacting proteins and used them to tether filaments directly to the surface of a glass slide for visualization. We used the chemically inactivated myosin II motor protein (NEM-myosin) as it is the standard choice for this type of assay (Kuhn and Pollard, 2005). The filamin protein (Kueh et al., 2008) was used, which is an important player in cellular mechanosensing that is evolutionary-conserved (Razinia et al., 2012), as its use as a tether has recently generated some debate (Mullins, 2012; Niedermayer et al., 2012). Additionally, we selected α-actinin, a molecule that, together with myosin II, forms stress fibers (Langanger et al., 1986), and VASP, a protein that localizes to areas of dynamic actin reorganization such as filopodia and the lamelipodium (Rottner et al., 1999). By carrying out these assays with several proteins that bind to the side of actin filaments, we were able to explore the possible range of modulation available to actin filament dynamics and delineate intrinsic filament properties. Fluorescently labeled actin was used to visualize the growth of actin filaments (Figure 1A–B) using TIRF microscopy. In this technique, single actin filaments are tethered to a glass surface via a side-binding protein and their growth and/or shrinkage is monitored in real time (Figure 1A–B). From each frame, the filament is extracted and a kymograph is constructed (Figure 1—figure supplement 1). The position of each end of the filament was then determined by fitting an error function (Demchouk et al., 2011) to each line of the kymograph (see ‘Materials and methods’ and Figure 1—figure supplement 1 for details). This end-detection method provides a more accurate determination of the filament length and thereby a more reliable estimate of the instantaneous elongation velocity compared to methodologies used previously (Figure 1—figure supplement 1). The dependence of the barbed-end kinetics on the side-binding protein. (A) A schematic of total internal reflection illumination and single actin filament imaging of filaments tethered to a glass surface. Filaments grow from the addition of subunits at either the barbed- or the pointed-end. (B) Selected frames from a movie showing the growth of a single actin filament that is tethered to the surface via α-actinin. The barbed-end is marked by a red arrowhead and the pointed-end by a blue dot. The elapsed time interval is given in seconds. Scale bar: 5 μm. L0 and ΔL are the initial filament length and the change in length, respectively. (C) ΔL as a function of time for single filaments grown on surfaces with different tethering proteins. (D) Elongation velocity (E) as a function of actin concentration in solution for different tethering proteins (inset, zoom out of the VASP and VASP ΔGAB values). The elongation velocity was determined from the slope of the graphs of ΔL vs time in regions where no pauses were observable. Error bars represent s.e.m. (n > 20). Tether density here is ∼2000 molecules/μm2. The single-filament elongation experiments showed that the barbed-end grew at a constant velocity with occasional pauses for all constructs measured while the barbed-end elongation velocity varied depending on the particular side-binding protein used (Figure 1C,D). The elongation velocity ‘E’ at the barbed-end was the fastest with VASP and the slowest with α-actinin (Figure 1C). By varying the free actin concentration from 0.3 to 2 μM, we estimated the barbed-end association and dissociation rates, kon and koff, respectively (Figure 1D), using only the periods of elongation (i.e., E > 1.5 sub·s−1, referred to hereafter as the ‘kinetically active’ phases). Compared to the previously reported value of 11.6 sub·μM−1·s−1 for actin only in the absence of tethering proteins (Pollard, 1986), we found a higher value of kon in the presence of VASP, a similar value for actin alone and for NEM-myosin, and lower values when α-actinin or filamin were used (Figure 1D and Table 1). Extrapolating the elongation velocity as a function of actin concentration to zero actin provides an estimate of the dissociation rate, koff, of ATP-actin at the barbed-end (Table 1). In the presence of filamin, koff is indistinguishable from zero, whereas in the presence of VASP, koff increased compared to the value in the presence of NEM-myosin (1.6 ± 0.5 s−1). The estimated koff we measured in the presence of NEM-myosin was in agreement with the previously reported value of 1.4 s−1 (Pollard, 1986), whereas in the presence of α-actinin, koff was lower than 1.4 s−1. The ratio of inferred dissociation rates to the calculated association rate (i.e., koff/kon) is the critical concentration at which polymerization will occur and has been estimated to be ∼150 nM for the barbed-end (Pollard, 1986). We find a similar value (∼0.2 μM) for filaments elongated in the presence of VASP, α-actinin and NEM-myosin, but close to zero for filamin. The use of VASP induced the largest change in the measured kinetics. In contrast to the other three proteins measured, the kinetics were enhanced. VASP is known to act as a polymerase at the barbed-end by delivering subunits to the growing end (Hansen and Mullins, 2010; Breitsprecher et al., 2011). It achieves this function through its two actin-binding domains: a G-actin-binding domain that delivers monomers (via G-actin binding or GAB domain) while remaining attached to the filament via the F-actin-binding or FAB domain (Breitsprecher et al., 2008, 2011; Hansen and Mullins, 2010). To rule out the polymerase activity of VASP as the cause of enhanced kinetics, we also tested a VASP construct that lacks the GAB domain but retains its capacity to interact with the filament lattice (Breitsprecher et al., 2008). We continued to observe fast polymerization using this VASP-ΔGAB protein as a tether (Figure 1) in agreement with previous reports (Breitsprecher et al., 2008). The measured kinetic rates were 70 ± 30 sub·μM−1·s−1 for kon and 14 ± 9 s−1 for koff, about half of those determined using the full-length VASP construct. Therefore, the effect of immobilized VASP on filament kinetics is not only due to recruitment of monomers to the growing filament. These results demonstrate that ATP-actin kinetics at the barbed-end are sensitive to the particular side-binding protein interacting with the filament. All reported errors from this work are 95% confidence intervals whereas those of (Pollard, 1986) represent SD. All reported dissociation constants from this work are inferred from extrapolation of the elongation velocity as a function of actin concentration to zero concentration, data from Figures 1, 2 and 4. Pointed-end association and dissociation rates were estimated in the same manner as those for the barbed-end (Figure 2A). Both the estimated association rates and dissociation rates varied according to the associated side-binding protein used as a tether (Figure 2A and Table 1). The presence of filamin increased the konP by a factor of ∼5 (from 0.8 in the presence of NEM-myosin to 2.8 sub·μM−1·s−1). The konP for α-actinin was 0.9 sub·μM−1·s−1, while, when using VASP or VASP ΔGAB, the rate was 44 sub·μM−1·s−1 and 16 sub·μM−1·s−1, respectively. On the other hand, the presence of filamin also increased the inferred koffP by almost an order of magnitude from 0.4 (in the presence of NEM-myosin) to 2.6 s−1. The inferred koffP rates were 0.7 s−1, 8 s−1, and 5 s−1 with α-actinin, VASP, and VASP ΔGAB, respectively (Table 1). Pointed-end elongation and depolymerization kinetics as a function of the associated side-binding protein. (A) The elongation velocity (E) is plotted as a function of free actin concentration. Error bars are s.e.m. (n > 20). (B–C) A gallery of traces of ΔL as a function of time for pointed-ends observed at (B) 1 μM or (C) 0.3 μM free actin monomer concentration for the different tethering proteins studied. The raw data are shown in color, and the black solid lines are a running average of 10 data points. Unlike the barbed-end where there were occasional pauses (Figure 1C), the pointed-end displayed mostly a kinetically inactive phase or paused state and only grew sporadically (Figure 2B,C). Such kinetically inactive phases were observed for all free actin concentrations tested (250 nM–2 μM). Above the pointed-end critical concentration (e.g., using a free actin concentration of 1 μM), we observed a discontinuous (i.e., growth-pause) behavior for all side-binding proteins (Figure 2B). In the presence of VASP or filamin, pointed-end elongation was readily observed. Pointed-end elongation was much more difficult to visualize when using NEM-myosin and α-actinin (Figure 2B) where elongation occurred for brief periods of time and with slower rates. The elongation velocity during kinetically active phases was influenced strongly by the different tethering proteins used (Figure 2A). 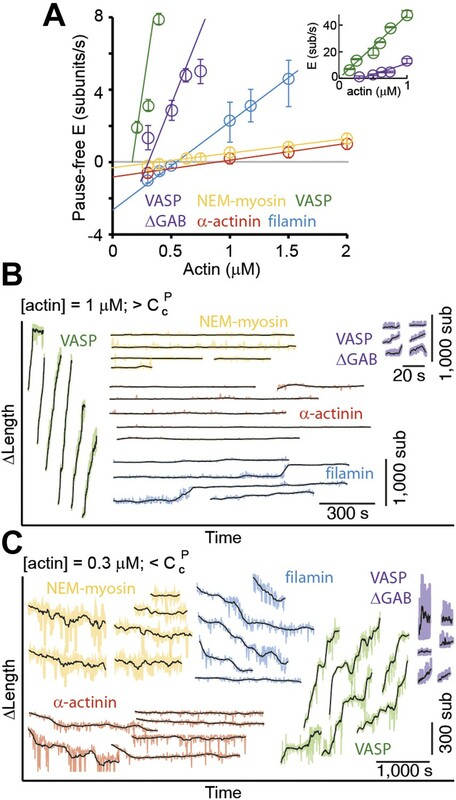 Elongation velocity followed the order of VASP > VASP ΔGAB > filamin > α-actinin > NEM-myosin (Figure 2A,B). On the other hand, at 300 nM free actin monomer concentration, i.e., below the pointed-end critical concentration of ∼600 nM (Pollard, 1986), we observed barbed-end growth (Figure 1D) and pointed-end depolymerization (Figure 2C), i.e., treadmilling, in the presence of filamin as a tethering protein (Figure 2C). Treadmilling was also present using NEM-myosin and α-actinin, albeit with slower rates, since pointed-end depolymerization establishes the overall treadmilling rate. In contrast to our expectations, there was no shrinkage at the pointed-end below the critical concentration but polymerization in the presence of VASP or VASP ΔGAB (Figure 2). These results suggest that side-binding proteins can also determine actin filament pointed-end growth and depolymerization dynamics. Additionally, these results show that observed effects at one end do not necessarily represent effects at both ends. For example, filamin reduces only the dissociation rate (and therefore the critical concentration) at the barbed-end although it alters both the association and dissociation rate at the pointed-end. Next, we studied how sensitive filament dynamics are to the presence of each of the proteins tested. Therefore, we measured the elongation rates and pausing as a function of the side-binding protein surface density (Figure 3). For this, we varied the total protein concentration that was allowed to adsorb to the glass surface, therefore changing the number of tethering proteins that interact with a single filament. We estimated the lattice-binding protein surface density from the protein concentration, the sample volume (∼10 μL) and the surface to which the sample was adsorbed (a flow cell of 5 mm × 20 mm, giving 100 mm2) as done previously (Howard et al., 1989; Crevenna et al., 2008). All protein in solution was assumed to adsorb on the upper and lower glass surfaces. To achieve consecutive lower tether densities, the total protein concentration was serially diluted. At low tethering protein concentrations, individual filaments swiveled around distinctive attachment points indicating that they are bound to single tethering molecules as observed previously (Howard et al., 1989; Crevenna et al., 2008). To estimate the density in an alternative manner, we measured the average number of pivot points per micron of filament at the two lowest protein concentrations and divided that by the average area covered during swiveling. Assuming a linear scaling with protein concentration, this estimate results in a lower density (by a factor of 2) compared to those reported in Figure 3 and throughout the text. Estimated densities ranged from ∼5 up to ∼18,000 molecules·μm−2, which are equivalent to values between 0.1 and 110 tethers per micron of filament (Figure 3). Barbed-end actin filament elongation as a function of the surface density of side-binding proteins. (A–B) The change in length, ΔL, of actin filaments as a function of time when using filamin as the surface tethering protein at the (A) lowest (5.9 molecules/μm2 or 0.03 molecules per micron of filament) or (B) the highest (5900 molecules/μm2 or 35 molecules per micron of filament) density. (C–D) Distribution of elongation velocities for filaments using a filamin-coated surface at the (C) lowest or (D) highest density. Solid lines are fits to Gaussian distributions. The distribution is calculated by binning the instantaneous elongation velocity of more than 20 filaments into 0.75 subunits/s bin size. (E) Elongation velocity as a function of tether surface density estimated from the kinetically active phases. The surface density is plotted as number of tethering proteins per unit surface area on the lower axis and the equivalent number of tethering proteins per μm of filament on the upper axis. Solid lines are fits to a model where protein binding induces an allosteric effect that persists along the filament over a certain length scale (see ‘Materials and methods’ for details). (F) Pausing probability as a function of surface tether density. Error bars represent s.e.m. (n > 20). At low tether densities (5–200 μm−2 or 0.025 to 1.0 molecules per micron of filament), the dynamics were independent of the tethering protein used. As an example, filamin is shown in Figure 3A–D. Elongating actin filaments (at a free actin monomer concentration of 1 μM) showed mostly kinetically active phases (Figure 3A), and the elongation velocity distributions were centered around ∼9 subunits·s−1 (Figure 3 and Figure 3—figure supplement 1). At high tether densities (600–18,000 μm−2 or 3–110 molecules per micron of filament), each side-binding protein tested generated a particular elongation behavior (Figure 3E and Figure 3—figure supplement 1). Using filamin, increasing the surface tether density decreased the mean elongation velocity of kinetically active phases (Figure 3B,D) and increased the fraction of time the filament spent in a paused state, i.e., the pausing probability ‘Pp’ (Figure 3B,D,F). In contrast, increasing the VASP or the VASP-ΔGAB density increased the elongation velocity while VASP also increased the Pp (Figure 3 and Figure 3—figure supplement 1). Higher surface concentrations of α-actinin or NEM-myosin had also an effect on the elongation velocity (Figure 3—figure supplement 1) and, in addition, the density of NEM-myosin had a strong effect on the Pp (Figure 3F and Figure 3—figure supplement 1). One possible explanation for these results could be geometric and/or mechanical constrains imposed on the filament by the high density of the surface-immobilized side-binding protein used. To investigate this possibility, we carried out experiments where a very low density of NEM-myosin was used to tether filaments to the surface while a second, side-binding protein was present in solution. We tested the effects of VASP, VASP-ΔGAB, and filamin on filament growth. The influence of all three side-binding proteins on the elongation rate of both the barbed- and pointed-end were similar to what we observed when using them to immobilize the actin filaments to the surface (Figure 3—figure supplement 2 and Table 1). We also performed these experiments with human VASP and the elongation rates measured for both Dd VASP and Hs VASP agree with previously reported results (Breitsprecher et al., 2008; Hansen and Mullins, 2010) (Figure 3—figure supplement 3). These results suggest that a variety of elongation kinetics can arise from the specific interaction of actin filaments with the particular associated side-binding protein. To further verify that the observed kinetic changes and pauses originate from the particular side-binding protein used as a tether, we investigated the intrinsic properties of filament elongation and controlled for artifacts. Single elongating filaments were measured at the lowest protein surface density possible that still allowed filament visualization. At the lowest α-actinin tether density used (5 molecules μm−2, which corresponds to 1 tether molecule every 5–10 microns along the filament), the ends swiveled around their tethering site due to Brownian motion and were clearly free of the surface (Figure 4A). Under these conditions, barbed-ends showed continuous elongation (Figure 4B) while pointed-ends were typically in the kinetically inactive state (only 2 of 50 filaments showed growth or depolymerization, Figure 4C–D). For the other tethering proteins, only the paused state was observed on freely swiveling pointed-ends (Figure 4—figure supplement 1). Using only the pause-free elongation velocities for each actin concentration tested, we estimated association and dissociation rates (slopes in Figure 4E, Table 1). Our estimated values for the pause-free elongation kinetics agree well with those previously obtained by EM (Table 1), which were measured on the 20–60 s time scale. When we convolute our pointed-end pause-free elongation rate with the pausing probability, our results are comparable to the kinetics estimated by TIRF experiments (Kuhn and Pollard, 2005). One possible explanation for this discrepancy is that continuous pointed-end growth occurs at the beginning of filament assembly, which is suggested from our data (Figure 4C) and is the time scale on which the EM data was acquired (Pollard, 1986). Moreover, the pausing probability, Pp, at either end was insensitive to the actin concentration used (Figure 4F). (A) A maximum projection image from a movie of an actin filament tethered to a glass surface via a single α-actinin molecule where the tethering position about which the filament swivels is visible as a constriction point. Scale bar: 3 μm. 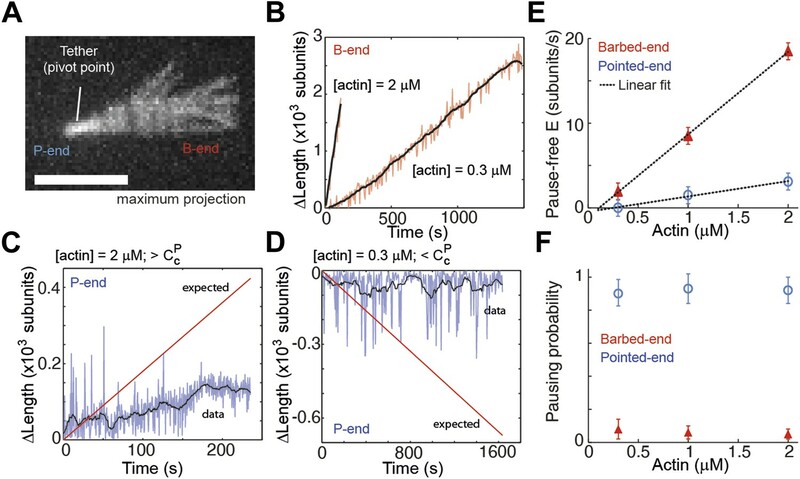 (B) Change in length of the barbed-end vs time for individual actin filaments attached to the surface using the lowest tethering protein surface densities at 300 nM and 2 μM concentrations of free actin monomers. (C–D) Change in length vs time of the pointed-ends of single, elongating actin filaments using the lowest tethering protein surface densities and either 2 μM (C) or 300 nM (D) of actin monomers free in solution. The red lines represent the expected elongation behavior based on previously reported rates using NEM-myosin as a tether (Kuhn and Pollard, 2005; Fujiwara et al., 2007). (E) The pause-free elongation velocity (E) plotted as a function of free actin concentration. The lines represent linear fits. Estimated rates are reported in Table 1. Error bars are s.e.m. (n > 20). (F) Pausing probability as a function of free actin concentration. Error bars represent s.e.m. (n > 20). The low density used for these experiments and the observed pauses on freely swiveling actin filaments (pointed-end only) rules out surface effects (Kuhn and Pollard, 2005) as the determining cause for the pauses at the ends. Another possible source of pauses is light-induced photo-dimerization. From the work of Niedermayer et al. (2012), it is possible to quantitatively predict the accumulated fraction of filaments where depolymerization has been paused as a consequence of exposure to light (Figure 4—figure supplement 2). In contrast with this prediction, we observed all swiveling filament pointed-ends, under depolymerizing conditions, to be in a kinetically inactive state at the beginning of image acquisition (N = 40, Figure 4—figure supplement 2). Only in the presence of a medium to high density of tethering proteins did we observe depolyermization of pointed-ends (12 of 55, Figure 4—figure supplement 2). As an additional test to rule out any tether, surface or light-induced effect of the pausing, we used a two-color solution assay to investigate pointed-end growth. Here, a small seed (formed with atto565-labeled actin) was allowed to grow in solution for 15 min in the presence of atto488-labeled monomers, followed by stabilization, dilution, and visualization of the filaments (Figure 4—figure supplement 3). At a free actin concentration of 1 μM, the concentration used in solution to allow filament elongation, all pointed-ends are expected to grow at an average rate of ∼0.5 sub/s (Pollard, 1986). In contrast to this expectation, we observed that only 20% of the seeds grew at the pointed-end (N = 1000, Figure 4—figure supplement 3). This percentage is higher than we observe in the surface-based experiments, which could be due to annealing of filaments in solution (Sept et al., 1999; Andrianantoandro et al., 2001) or due to lack of the tethering protein. What is clear is that the non-elongating or paused state is not due to either surface or light-induced effects. Taken together, these results show that a single rate constant describes filament elongation kinetics from ATP-monomers in the absence of side-binding proteins and that the pointed-end has an intrinsic kinetically inactive state. During the course of filament elongation analysis as a function of side-binding protein density on the surface (Figure 3), we noticed that filaments appeared more bent as the tether density increased. To quantify this curviness, we estimated an apparent persistence length ‘Lp∗’ of individual filaments associated with different side-binding proteins (see ‘Materials and methods’ for details). The persistence length Lp (Boal, 2012) reflects the material properties of the filament, which are related to its structure (Chu and Voth, 2005, 2006; Pfaendtner et al., 2010), and has already been shown to be tunable by side-binding proteins (such as myosin or cofilin [McCullough et al., 2008; Murrell and Gardel, 2012; Bengtsson et al., 2013]). At the lowest side-binding protein density (∼10 molecules μm−2 or ∼0.1 molecules per filament micron), actin filaments had an Lp∗ of ∼18 μm and was independent of the associated protein (Figure 5A). At the highest densities (∼16,000 molecules·μm−2 or ∼100 molecules per filament micron), the presence of NEM-myosin decreased the Lp∗ to 4 ± 1 μm while it was reduced to 3 ± 1 μm, 5 ± 1 μm, and 2.2 ± 0.3 μm when using filamin, VASP and α-actinin, respectively (N > 50 for each condition, Figure 5A). Estimates for the persistence length of surface adsorbed filaments are consistent with what has been determined for freely fluctuating filaments (McCullough et al., 2008; Graham et al., 2014). We also tested the mechanical effect of the side binding proteins on the actin filament when the actin filaments were attached to the surface with a low density of NEM-myosin and the side-binding protein was present in solution. 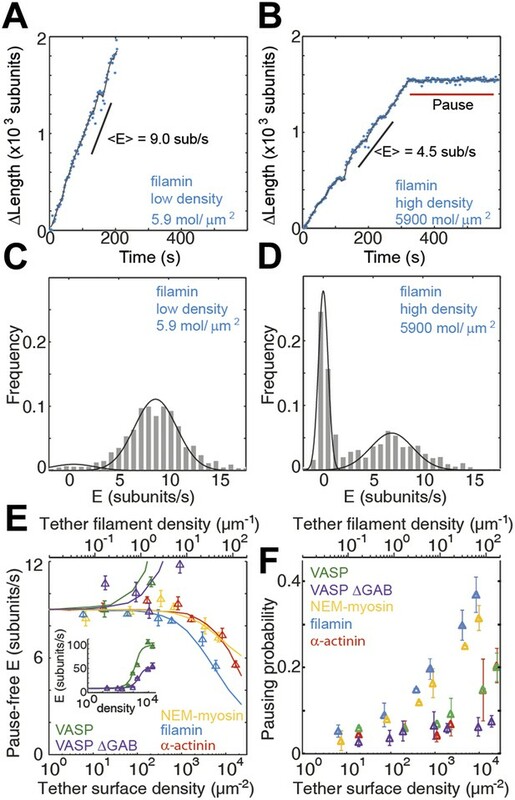 Again, we observed a decrease in the persistence length of about 30% for filamin, α-actinin, and NEM-myosin, whereas the effect was about 50% in the presence of VASP or VASP ΔGAB (Figure 5A). Side-binding proteins alter filament structure. (A) (left panels) Images of individual filaments attached to the surface using different side-binding proteins at the lowest or highest surface density of tethering protein. Scale bar: 5 μm. (right panels) Estimated apparent persistence length from the angular correlation along the filament contour length at the lowest (red) and the highest (blue) lattice-binding protein densities, and when the protein is present in solution (green). Error bars represent s.e.m. of more than 50 filaments measured per experimental condition. (B) Images from a movie of an individual growing actin filament under treadmilling conditions. The barbed-end is marked with a red arrowhead and pointed-end with a blue dot. The filament undergoes a fragmentation event (yellow star) at 488 s and afterwards depolymerizes from its new pointed-end while the newly created barbed-end does not elongate. The free-actin concentration was 400 nM. Time is given in seconds. Scale bar: 5 μm. (C) Characterization of the direction of barbed-end filament growth as a function of the tethering protein used (see ‘Materials and methods’ for details). Examples of each class are shown in the left panels. Scale bars: 3 μm. α-actinin was observed to grow almost exclusively in the counterclockwise direction. No preferred direction of growth is observed for the other side-binding proteins measured. Two other interesting phenomena were observed in the presence of side-binding proteins at high densities. First, the presence of filamin increased the spontaneous fragmentation of filaments (20 out of 197 filaments vs less than 1 fragmentation even per 200 filaments) (Figure 5B). Second, barbed-end elongation when tethered with α-actinin had a preference to grow in a counterclockwise direction (Figure 5C). This counterclockwise elongation observed when α-actinin was present was independent of the length the filament had when it landed on the surface. These observations suggest an influence of the tethering protein on the structural properties of the filament. Changes in the structure of the filament by binding proteins are known to be able to propagate over several subunits (Orlova et al., 1995). We hypothesize that structural alteration might be the origin of kinetic modulation. To test how well this interpretation could explain our results, we constructed a simple model based on long-range structural alterations to describe elongation as a function of tether density (Figure 3E). In our model, the interaction between a growing filament and a tethering protein gives rise to a modified association rate (i.e., α⋅kon0) at the site of interaction, which then propagates over a certain distance LC (Figure 3—figure supplement 4). From the interaction site, there is a linear decay of the modified association rate, as a linear decay would be expected for the release of torsional stress. Using a Monte Carlo method (see ‘Materials and methods’ for details), we calculated α and LC (which are the only free parameters) by comparing the simulated elongation rates to the experimental values and minimizing the χ2 (Table 2). This simple model satisfactorily described our experimental results (Figure 3E, solid lines) and provides an estimate for the propagation length. We also considered the possibility that VASP acts via a ‘local increase in monomer concentration’ similar to Breitsprecher et al. (2011) (see ‘Materials and methods’ for details). This local concentration model did not account for the tether density dependence of elongation velocity (Figure 3—figure supplement 5), nor it can account for the effect observed with VASP ΔGAB that does not have the capacity to bind actin monomers. The binding of an actin-binding protein onto the lattice of a filament leads to changes (with magnitude α) in association kinetics that are propagated over a certain characteristic length LC, as a number of monomers. The value obtained by minimizing the χ2. The values in parenthesis represent the 68% confidence interval. Our estimate of the propagation length should be considered as a lower limit since additional factors that could potentially influence our assay such as tether unbinding (i.e., which would lower the effective number of interacting side-binding proteins) and/or alternative tether density calculations (see above) would result in longer propagation lengths. The induced effects are local-to-short-ranged (∼2-11 monomers) for α-actinin, filamin, and NEM-myosin while they are long-ranged when using VASP and VASP-ΔGAB (160 and 76 monomers, respectively) (Table 2). Collectively, these results suggest that the side-binding proteins tested alter the structure of the filament. 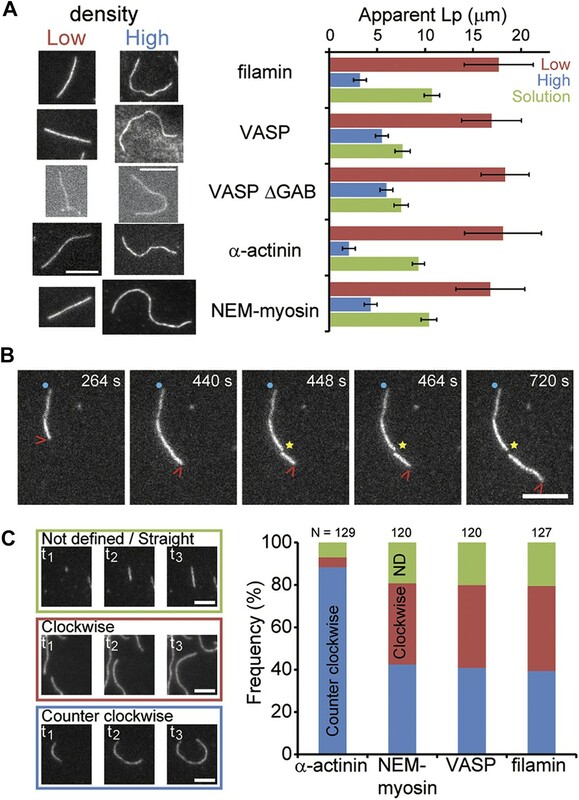 We have shown that asymmetry in filament elongation is a consequence of a non-elongating state at the pointed-end and that the general versatility of actin dynamics may be a response to the binding of various proteins. Through accurate measurements of pointed-end association kinetics, we have observed that experiments performed in the absence of tethering proteins and in the presence of VASP or VASP ΔGAB yielded equivalent critical concentrations for both ends (∼0.2 μM, Table 1). This implies that, under these conditions, detailed balance at equilibrium is fulfilled, i.e., koffB/konB=koffP/konP (Hill, 1987). We propose that the existing discrepancy in estimated critical concentrations at both ends (Fujiwara et al., 2007) originates from the presence of a previously uncharacterized kinetically inactive or non-elongating state at the pointed-end. This kinetically inactive state is consistent with a non-elongating structural conformation observed by cryo-electron microscopy (Narita et al., 2011). The kinetic asymmetry of the pure actin filament may be low (∼3) and such non-elongating or closed conformation at the pointed-end would reinforce the effective filament asymmetry. The transition at the pointed-end from the open to the closed state may be coupled to ATP hydrolysis or phosphate release at the terminal subunit. The presence of this open-to-closed transition at the pointed-end would explain why the terminal subunit has an estimated different rate of phosphate release compared to the filament lattice (Fujiwara et al., 2007). Actin filaments in association with any of the five proteins tested displayed a change in elongation velocity, an increase in pausing, and a change in filament flexibility. Therefore, it is possible that these three characteristics have a common origin. For three of these filament-binding proteins (myosin, α-actinin, and filamin), the binding interface to the actin filament is formed by two consecutive monomers along the same strand (Galkin et al., 2008, 2010; Lorenz and Holmes, 2010). These side-binding proteins might directly occlude the binding site for the next monomer either partially (reducing the elongation velocity) or completely (giving rise to an elongation pause). Partial distortion of the filament could turn into a defect that propagates along the lattice decreasing the observed filament stiffness and impacting the association rate. In this respect, side-binding proteins could be thought of as allosteric regulators of actin filament kinetics. Indeed, actin filaments are known to be subject to allosteric regulation by other associated proteins (Egelman and Orlova, 1995; Galkin et al., 2012). In particular, myosin (Prochniewicz and Thomas, 1997), cofilin (Galkin et al., 2001; Prochniewicz et al., 2005), dystrophin (Prochniewicz et al., 2009), and utrophin (Prochniewicz et al., 2009) are known to induce structural changes in the actin filament. Similar to filamin and α-actinin, dystrophin and utrophin bind actin through calponin-homology (CH) domains (Galkin et al., 2010). Moreover, binding to the filament is cooperative for cofilin (De La Cruz, 2005), αE-catenin (Hansen et al., 2013), and myosin (Orlova and Egelman, 1997). The basis for this allosteric regulation could originate from the stabilization of an existing structural state of the filament (Galkin et al., 2001), given that the actin filament is structurally polymorphic (Galkin et al., 2010). Therefore, it is possible that the observed elongation kinetics and pauses arise from direct modulation of the filament structure. In line with this hypothesis, two other proteins, the actin-binding domain of αE-catenin (Hansen et al., 2013) and an N-WASP construct (Khanduja and Kuhn, 2014), have recently been shown to alter filament kinetics and one of them, the actin-binding domain of αE-catenin, also influences filament structure (Hansen et al., 2013). Although atomically accurate simulations and more high resolution experiments are required to understand the molecular basis of monomer association and dissociation from the filament ends, our results provide evidence that lattice structural changes affect actin filament growth kinetics. The influence of different side-binding proteins on the growth kinetics was found to persist over different length scales. Although we do not currently know the mechanism of this difference, it is interesting to note that actin-binding proteins with globular binding domains (α-actinin, filamin, and NEM-myosin) have short-range affects whereas VASP and VASP ΔGAB, which have an unstructured binding motif, have more long-range affects. Our experimental approach of using tethers immobilized on a solid surface imposes geometric and/or mechanical constrains on filament growth. As actin filaments form part of the cell cortex (Biro et al., 2013) and focal adhesions (Kanchanawong et al., 2010) where they assemble into oligomeric membrane-anchored complexes with many actin-binding proteins tethered to the plasma membrane surface, our studies may not be too far from the biologically relevant situation in living cells. Moreover, the cell interior is very crowded (Luby-Phelps, 2000) and some sub-cellular actin arrays are tightly packed (Jasnin et al., 2013). Both of these conditions may lead to the immobilization of actin-binding proteins and generate similar constrains during filament growth. In addition, the presence of side-binding proteins in solution is sufficient for altering the filament kinetics and mechanics. Depending on the local cross-linker protein abundance in the cell, turnover kinetics on the order of 1 μm of filament within ∼1 min can be achieved, a rate at which treadmilling could become a contributing factor to cellular retrograde flow in the lamellipodium (Watanabe and Mitchison, 2002; Ponti et al., 2004). Additionally, filament structural changes generated by side-binding proteins may also play a more active role in the identity and turnover of actin-based sub-cellular structures than previously thought, by regulating processes such as branching and fragmentation (Hansen et al., 2013) or network mechanics (Jensen et al., 2014). Given the vast number of side-binding proteins, kinetic modulation via structural alteration may be a general regulatory mechanism of actin dynamics. Actin was obtained from chicken muscle using the method of acetone powder. Actin was extracted by one round of polymerization and pelleting by centrifugation (Spudich and Watt, 1971). The resulting pellet was depolymerized in G-buffer (1 mM Tris–HCl pH 7.8, 2 mM ATP, 2 mM CaCl2, 2 mM DTT) overnight at 4°C followed by gel filtration on a Sephacryl S-300 column. Myosin was purified and chemically inactivated with N-Ethyl-Maleimide according to the published protocol (Breitsprecher et al., 2009). Atto488-actin, α-actinin, and filamin were purchased from Hypermol (Bielefeld, Germany). Alternatively, actin was labeled with succinimidyl ester atto488 (ATTO-TEC GmbH, Germany) on random lysine residues. Actin labeling was performed under polymerization conditions (50 mM KCl and 2 mM MgCl2) followed by depolymerization and gel filtration in G-buffer. The functionality of 1:1 dye:protein lysine-modified actin was found to be unaffected by the labeling as has been previously characterized using pyrene polymerization assays, TIRF elongation, EM and FCS experiments (Crevenna et al., 2013). Unlabeled and labeled actin were mixed to yield a final ratio of 2:1 unlabeled:labeled actin molecules. The actin mixture (20 μl) was snap frozen and stored at −80°C until further use. Before use, an actin aliquot was centrifuged to remove possible aggregates. A plasmid containing the gene of Dd VASP was kindly provided by J Faix, (Hanover, Germany). VASP was expressed using a pCoofy plasmid in Sf9 cells with a MBP-tag and purified following standard methods as described previously (Scholz et al., 2013). MBP-VASP was used without cleavage, since removal of the tag resulted in protein aggregation and degradation. For VASP ΔGAB purification, the VASP coding sequence without residues 198–220 was amplified using the pCoofy28-full-length VASP as a template, forward primer 5′-GCGCTTTTATCAACACCGCCACCTGCGGCTGG-3′ and the reverse primer 5′-GCAGGTGGCGGTGTTGATAAAAGCGCTGGTGTACCAACAAAAAC-3′. Then the VASP(delta198-220) coding sequence was further cloned into a pEC-GST vector and expressed using E. coli BL21(DE3) as reported previously (Wang et al., 2014). Briefly, the E. coli strain was grown at 37°C in 2 L of ZY auto-induction medium for 5 hr and then the temperature was reduced to 18°C overnight. Cells were harvested and resuspended in 50 mM Tris pH7.5, 500 mM NaCl, 1 mM DTT supplemented with protease inhibitors and the cells were disrupted using sonication. The protein was purified from clarified cell lysate using a 5-ml GSTrap FF column (GE Healthcare, Germany) with elution buffer 50 mM Tris, pH7.5, 150 mM NaCl, 20 mM reduced glutathione, 1 mM DTT and further purified using size exclusion chromatography (Superdex 75, GE Healthcare, Germany) with buffer 50 mM Tris, pH7.5, 500 mM NaCl, 1 mM DTT. Flow cells were made as a sandwich of a cover slip (20 × 20 mm), parafilm with an approximate 5-mm wide channel and a glass slide. The surfaces of the flow cells were passivated to avoid adsorption of actin to the sample holder by incubating them with 10% (wt/vol) of BSA in PBS for 10 min. Flow cells were washed three times with 90 μl of G-buffer. The tethering protein was then applied for 5 min and the flow cell was then washed again three times with 90 μl of G-buffer. Actin (33% atto488-actin) was incubated 5 min on ice with 1/10 volume of 10x ME buffer (400 μM MgCl2 and 2 mM EGTA) to exchange Ca2+ for Mg2+. The actin-containing solution was mixed with imaging buffer (catalase, β-mercaptoethanol, glucose oxidase, 0.8% [vol/vol] D-glucose, 0.25% [wt/vol] methylcellulose, and 1/10 volume of 10x KMEI buffer [500 mM KCl, 20 mM MgCl2, 20 mM EGTA, and 300 mM imidazole], with a final pH of 7.1) and introduced into the flow cell. TIRF microscopy was performed using a TILL photonics inverted microscope (FEI Munich GmbH, Germany). A single actin aliquot was used within 12 hr. The lattice-binding protein surface density was estimated from the protein concentration, the sample volume (∼10 μl) and the surface to which the sample was adsorbed (a flow cell of 5 mm × 20 mm, giving 100 mm2) as done previously (Howard et al., 1989; Crevenna et al., 2008). All protein in solution was assumed to adsorb on the upper and lower glass surfaces. To achieve consecutive lower tether densities, the total protein concentration was serially diluted. At low tethering protein concentrations, individual filaments swiveled around distinctive attachment points indicating that they are bound to single tethering molecules as observed previously (Howard et al., 1989; Crevenna et al., 2008). To estimate the density in an alternative manner, we measured the average number of pivot points per micron of filament at the two lowest protein concentrations and divided that by the average area covered during swiveling. Assuming a linear scaling with protein concentration, this estimation resulted in a slightly lower density (by a factor of 2) compared to those reported in Figure 3. The concentration-based estimated densities represent an upper limit and are easy to reproduce. Hence, we report both in the text. Filaments were formed using atto565-labeled actin in G-buffer by addition of 1/10 volume of 10x KMEI buffer. After more than 2 hr of polymerization at room temperature, filaments were fragmented by shearing and subsequently mixed with atto488-labeled monomers and allowed to elongate for 15 min. Filaments were then stabilized with unlabeled phalloidin and diluted for imaging on an Epi-Fluorescent Microscope (Axiovert 200, Zeiss, Germany). Raw movies were corrected for x- and y- stage drift by first calculating its magnitude via image correlation spectroscopy (Hebert et al., 2005), and secondly, correcting the drift by bicubic interpolation. Drift estimation and correction were implemented in custom programs written in LabView and MATLAB (The MathWorks, MA). Kymographs of single filaments were made using Metamorph or Image J, while further analysis was carried out using MATLAB. Filament analysis tools are available at: http://www.cup.uni-muenchen.de/pc/lamb/actin_filament_dynamics.html. The position of the filament tip, per line in the kymograph, was estimated by fitting an error function as previously described (Demchouk et al., 2011). More than 20 filaments were analyzed per condition. To estimate the first pause distribution, we used the model described by Niedermayer et al. (2012) with ω = 2 × 106. The light intensity for treadmilling experiments ranged from 0.74 to 0.92 mW·mm−2. Growth orientation was assessed manually with the following criteria: Barbed-end filament growth direction was classified as straight/not-defined, clockwise or counterclockwise from experiments at the highest surface tether density. where v(xi) is the experimental velocity for density i, vsim(xi, α, LC) is the corresponding simulated velocity with parameters α and LC, and std(xi) is the experimental standard deviation for this data point. Hence, the only free parameters are α and LC and these were determined for each curve (i.e., elongation as a function of lattice-binding protein density). All simulations were done in MATLAB. where the brackets represent the average correlation function of the tangent θ, measured along the contour length s. The point spacing used to reconstruct a single filament was between 6 and 10 points per micron to avoid artifacts in the Lp estimation (Isambert et al., 1995; McCullough et al., 2008; Smith et al., 2010). All data analysis was done in MATLAB. Experimental points do not show a linear dependency on the protein surface density as expected from this model (Figure 3—figure supplement 5). An alternative mode of operation for VASP has been recently postulated where the protein not only increases the local concentration but also transfers monomers from its monomer binding domains to the filament tip (Breitsprecher et al., 2011). The surface density dependency of this alternative model would, nonetheless, predict a linear behavior as well, albeit with a different slope. In addition, this increased local concentration model would not explain the effect observed when using filamin, α-actinin, or with the VASP ΔGAB construct, which is unable to bind monomers. Journal of Molecular Biology 312:721–730. Cambridge; New York: Cambridge University Press. Methods in molecular biology 571:401–415. Annual Review of Biophysics 39:449–470. Proceedings of the National Academy of Sciences of the United States of America 102:13111–13116. The Journal of Biological Chemistry 288:12102–12113. Journal of Molecular Biology 346:557–564. Cellular and molecular bioengineering 4:192–204. The Journal of Biological Chemistry 261:12754–12758. Journal of Structural Biology 115:159–162. Proceedings of the National Academy of Sciences of the United States of America 104:8827–8832. Proceedings of the National Academy of Sciences of the United States of America 105:1494–1498. The Journal of Cell Biology 153:75–86. Nature Structural & Molecular Biology 17:614–616. Nature Structural & Molecular Biology 17:1318–1323. Molecular Biology of the Cell 24:3710–3720. The Journal of Cell Biology 191:571–584. The Journal of Biological Chemistry 270:11437–11444. Proceedings of the National Academy of Sciences of the United States of America 110:20521–20526. Molecular Biology of the Cell 25:55–65. Proceedings of the National Academy of Sciences of the United States of America 105:16531–16536. The Journal of Cell Biology 102:200–209. Annual Review of Cell and Developmental Biology 27:157–184. Proceedings/IEEE International Symposium on Biomedical Imaging 2009:1302–1305. Proceedings of the National Academy of Sciences of the United States of America 107:12529–12534. International review of cytology 192:189–221. Journal of Molecular Biology 381:550–558. Proceedings of the National Academy of Sciences of the United States of America 109:10743–10744. Proceedings of the National Academy of Sciences of the United States of America 109:20820–20825. Proceedings of the National Academy of Sciences of the United States of America 109:10769–10774. Journal of Molecular Biology 265:469–474. Journal of Molecular Biology 245:598–607. Journal of Molecular Biology 396:252–263. The Journal of Cell Biology 103:2747–2754. Proceedings of the National Academy of Sciences of the United States of America 106:7822–7827. Journal of Molecular Biology 353:990–1000. Annual Review of Biophysics 41:227–246. The Journal of Biological Chemistry 246:4866–4871. Proceedings of the National Academy of Sciences of the United States of America 111:11347–11352. Thank you for choosing to send your work entitled “Side-binding proteins modulate actin filament dynamics” for consideration at eLife. Your full submission has been evaluated by Vivek Malhotra (Senior editor) and 3 peer reviewers, one of whom is a member of our Board of Reviewing Editors, and the decision was reached after discussions between the reviewers. Based on our discussions and the individual reviews below, we regret to inform you that your work will not be considered further for publication in eLife. As you can see from the reviews, there is enthusiasm for the role of side binding in modulating actin filament dynamics. There is no question in our minds that this could be a significant contribution to the field. However, we feel that there is a lot of work required to make many of the experiments solid. We think that one of the key problems is summarized by Reviewer 1. Your main results come from VASP, while the other proteins have a more modest effect. The problem with VASP as a 'side-binder' is that it contains a g-actin binding domain and can function as a polymerase. We think at minimum you would need to perform experiments using VASP with a debilitated or missing g-actin binding domain to unambiguously ascribe the effects they observed to the side-binding activity of VASP. A second problem highlighted by another reviewer is that the experiments here were all done with the side-binding proteins acting to tether the actin to the slide surface. It seems important to also conduct experiments where the side-binders are not tethered. It is possible that some of the effects seen here result from torque induced by sequentially attached immobilized proteins, at least at high tethering density, and also the kinetic of side-binder binding and detachment. In this paper, the authors report the effects of 'side-binding' proteins on actin polymerization kinetics. They use TIRF microscopy to measure the rates of growing and shrinking at the level of individual actin filaments, observe that the side-binders give different density-dependent effects, and attempt to connect their findings to the structure of the filament using computational simulations. This is a potentially interesting study that combines a variety of approaches to study a challenging and timely problem: how allostery can modulate the polymerization dynamics of biologically important polymers. From my perspective the most interesting claim is that different side-binding proteins can differentially tune the polymerization kinetics by perturbing/modulating the structure of the filament over length scales that exceed nearest neighbor relationships. Even while recognizing the challenging and interesting nature of the subject under study, however, I am not convinced that the authors' data provide unambiguous support for their headline claims. 1) VASP gives by far the largest effects (e.g. 10-fold increase in apparent kon, etc. ), and is presented and interpreted as a 'side-binding' protein. Without the big effect evident from VASP, I think the results are less striking because much more modest in nature. The problem with VASP as a 'side-binder' is that it contains a g-actin binding domain and can function as a polymerase. I think at minimum the authors would need to perform experiments using VASP with a debilitated or missing g-actin binding domain to unambiguously ascribe the effects they observed to the side-binding activity of VASP. Otherwise they need to do some significant re-phrasing and acknowledge that maybe the VASP polymerase activity is contributing to the fast elongation, and this will mitigate and confuse the impact of their findings about the possible role(s) of side-binders. I think such an experiment should be readily achievable. 2) Excepting VASP, the observed effects on instantaneous growth rates are relatively modest and require substantial amounts of the side-binder. Effects on pausing are more substantial but it seems possible those are artifacts (see next point). In any event, pausing does not seem to be the core point of the paper. If I understand Figure 3E properly, beside VASP there is little effect on 'pause-free E' until a density of about 1000 side-binders per μM^2. If I calculated right that is 1 side-binder roughly every 8 nm. But at 370 actins/μM of polymer, 8 nm average spacing between side-binders equates to something like one every 3 actins. Requiring such high densities undermines the claim of longer-range effects. 3) The authors presented some controls for non-specific surface effects, but I'm not sure they can rule out specific surface effects. Is the rate of filament growing or shrinking affected by how close the filament end is to the coverslip? Is it possible to do a subset of these experiments with side-binder in the solution but not on the coverslip (and using low densities of NEM-myosin on the coverslip)? If so, and if similar changes were observed it would help argue against the possibility that the results were an artifact of having a coverslip coated with filament binders. I don't view such an experiment as essential, but it would help. Likewise, unless I am overlooking something the bending seemed like it could be largely explained by a model in which the high density of side-binder simply 'grabbed' a fluctuating filament end. 4) There seems to be too wide a gap between the TIRF measurements and the Brownian dynamics simulations. The simulations show that different filament structures can give rise to different on rate constants, but by itself this claim is not surprising to me and I don't think it can be taken as evidence that the side-binders actually exerted their effects by altering the structure of the filament. Maybe they did, of course, but alternative explanations have not been convincingly ruled out. How to fix this is not obvious, but for me the connection between the TIRF results and the Brownian dynamics was too tenuous, and for me this weak connection undermined the thrust of their interpretation. The relationship between actin filament structure and actin filament dynamics, and how these can be modulated by filament binding proteins, is a long-standing and important question in the cytoskeletal field. Although some studies suggest that side-binding proteins can, through long range conformational effects, affect the kinetics and thermodynamics of monomer addition and dissociation at the filament ends, this has not yet been carefully examined. Moreover, there is some controversy in the recent literature on single actin filament dynamics arising from technical problems in the measurements. The work here addresses these issues through quantitative TIRF imaging of filament dynamics, and some computational analyses. The authors have used a new, more accurate procedure to determine the instantaneous position of the filament ends during imaging, which has revealed new aspects of filament dynamics not observed (or observable) in previous studies. 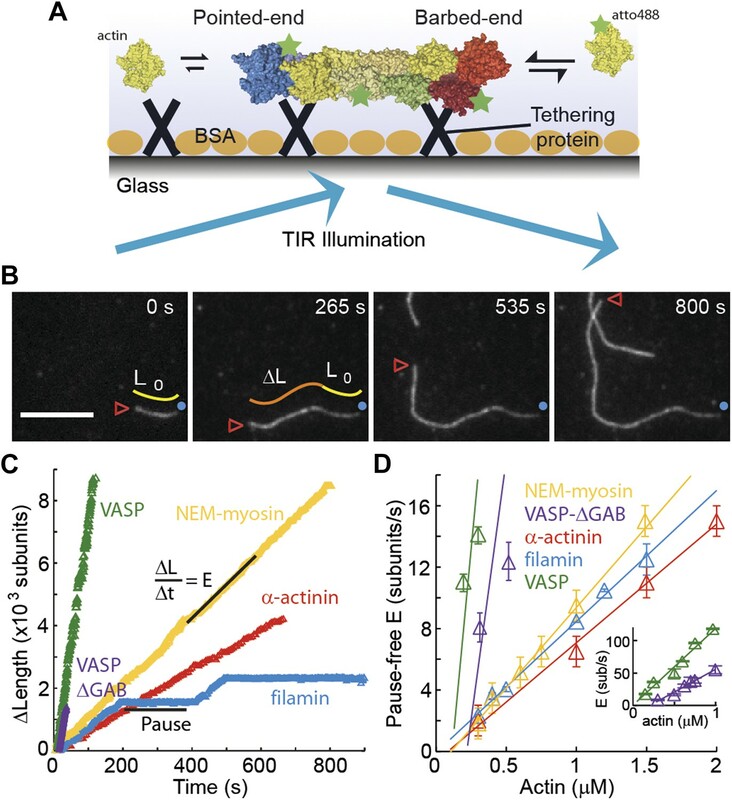 This has led to several interesting conclusions, including that different side-binding proteins have different effects on actin binding and dissociation rates at the filament ends, and that the pointed end significantly populates a kinetically-trapped state. In my opinion these advances would merit publication in eLife. However, I have concerns about some of the data that the authors will need to address before the work is technically solid. I am also less positive about the computational work at the end of the manuscript, and feel that is detracts from the experimental observations and should be down-played or removed. First, the experiments here were all done with the side-binding proteins acting to tether the actin to the slide surface. It seems important to also conduct experiments where the side-binders are not tethered. It is possible that some of the effects seen here result from torque induced by sequentially attached immobilized proteins, at least at high tethering density, and also the kinetic of side-binder binding and detachment. Perhaps one molecule could be used at low density to immobilize the filaments, and a second could be added in solution? Second, it is unclear to me how the kinetic parameters at the pointed end measured here for single filaments agree so well with previous bulk measurements, given the high pause probability illustrated in Figure 4. That is, according to line 201, the kon and koff values in Table 1 are derived from the pause-free elongation rates. But the previously reported bulk measurements should represent a convolution of those parameters with the pausing probability, which is very high for the pointed end (Figure 4F). So the bulk rate constants should be much lower than those measured from the pause-free portions of the single-filament data. Third, given recent controversies regarding the effects of unintended photo-crosslinking on actin filament dynamics (Niedermayer et al., 2012; Kueh et al., 2008), the authors need to make certain that the interesting behaviors they observe are independent of such processes. The data in the Figure 4 supplements are compelling in this regard. Nevertheless, both of their fluorophores, atto565 and atto488, are attached to actin in the same manner, through non-specific coupling to lysine residues. It is possible that the modified sites are particularly prone to photo-crosslinking. It would add even greater strength to their arguments (and be easy to do) to also try maleimide labeling, which uniquely modifies cysteine 376 in actin. Related to this point, the authors need to characterize and describe the labeling of their actin with atto488/565: how many sites on average were modified, what was the variability from preparation to preparation, what collection of sites were modified? How do they know that the labeling did not affect the properties of the actin? Fourth, the modeling to fit the data in Figure 3E should be described in more detail in the main text. This information should not all be shifted to the methods section. Why does the effect of VASP propagate over a much longer range than the other ligands? Shouldn't LC be largely dependent on actin itself? It's hard to see how there could be 2 orders of magnitude difference between α-actinin and VASP. Can the authors explain this based on other observations? Perhaps related, while I am not an expert at modeling, the huge 68% confidence interval and large difference between VASP and the other proteins raises concerns about this analysis. Finally, in my opinion the computations at the end of the paper do not strengthen the conclusions of the work, and provide a false sense of validation of the experimental data. I am highly suspect of the ability of MD simulations to accurately predict binding rates from the different structural models. The system is too complex, and the structural models themselves are at too low resolution. Further, it is almost certain that an actual filament samples many different structures contained within the manifold sampled by the available models. The finding that different structures produce different predicted rates in the calculations is not surprising; different starting points should give different simulations. But I don't see how these computed rates can be meaningfully interpreted or related back to the experimental data (e.g. is the Namba mode 3 structure a better model for the filament because it gives kinetic parameters that better match the experimental data? We can't know, since we don't know how well the simulations predict the kinetics in the first place). So I don't feel that the simulations either support or refute a relationship between structure and kinetics. Crevenna et al. used TIRF microscopy to conduct a detailed study on how the dynamics at the barbed end and the pointed end of the actin filaments change in response to binding of four proteins to the side of actin filaments. As summarized in Table 1, the binding of these proteins often changed the kon and koff at the barbed and pointed ends significantly. Therefore, this reviewer agrees with the authors that binding of proteins to the side of actin filaments “may be a ubiquitous mechanism to generate the rich variety of observed cellular actin dynamics”. This reviewer finds this well documented here and interesting. The authors used Monte-Carlo simulations to understand why side binding proteins change dynamics at the ends of actin filaments. They highlight shortcomings of models proposed earlier, and propose that these protein work through “exploiting the natural malleability of the actin filament structure”. This reviewer finds the proposal of the authors reasonable. However, the precise mechanism of how the side-binding proteins affect dynamics at the ends of actin filaments remains unclear. 1) The authors document a “kinetically inactive phase” at the pointed end of actin filaments. This reviewer finds this interesting. The authors also report high pausing probability in presence of NEM-myosin (Figure 3F). 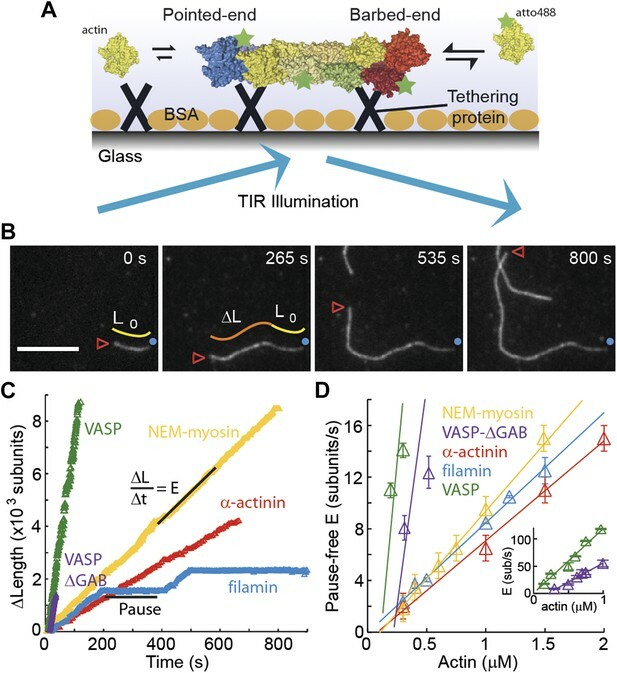 Since NEM-myosin has been widely used in TIRF assays to study dynamics of individual actin filaments, the author should comment if kinetically inactive pointed ends and paused barbed ends have been observed before, and how these measurements compare to those reported in this study. In case these have not been observed before, what did the authors do differently from previous studies? 2) The authors document that at higher side-binding protein density, actin filaments tend to grow either in a clockwise or in a counter-clockwise fashion. In presence of α-actinin, the actin filaments grow almost exclusively in a counter-clockwise fashion (Figure 5C). The authors should repeat these measurements for long actin filaments to test if their conclusion still holds. For instance, see the micrograph in α-actinin case in Figure 5A. We were very pleased that all three reviewers were very positive regarding our research and that they considered it to have the potential to be a significant contribution to the field. From your decision letter, we understand that “It is the policy of eLife not to ask for substantial experimental work before acceptance.” The recommended experiments are feasible within a short time (90 days). Hence, we do not find the additional experimental work to be “substantial”. In addition, they would strengthen our findings and provide more convincing evidence of our proposed interpretation. Therefore, we would like to ask you to consider a revised version of our manuscript that incorporates the reviewers’ comments and the additional suggested work. We thank the reviewers and the editors for the constructive comments. To address the two main issues summarized by the editor above, we have performed measurements with VASP-ΔGAB and with a low density of tethering proteins and additional side-binding proteins in solution. The results have been included in the revised manuscript. Below is the detailed point-by-point response to the comments raised by the reviewers. We thank the reviewer for this excellent suggestion and have now included experiments using a VASP construct with a deletion of the GAB domain. Filaments growing with this VASP ΔGAB construct as a tether showed very similar behavior to those using the full length VASP construct. The new data has now been incorporated throughout the manuscript and strengthens the hypothesis that it is the side-binding capacity of VASP that alters kinetics of filaments. We apologize for this confusion. To convert from surface density to filament density, we have multiplied the surface density with the area occupied by 1 micron of filament (1μm x 6nm). Using this calculation, (1000 molecules μm-2 * 0.006 μm2 filament area) we obtain that VASP starts to exert an effect in kinetics at binding densities of ∼ 6 molecules per micron of filament and at filament densities of 10-20 binders per μm for the other proteins, supporting our observation of long-ranged interactions. To aid in the result presentation and help the reader in understanding the effects of side-binders on the filament growth, we have added a second x-axis in Figure 3 and we now mention the linear density throughout the manuscript. Again, we thank the reviewer for this excellent suggestion and agree that experiments with a low density of NEM-myosin on the surface while another side-binding protein is present in solution would help in clarify the origin of pauses. Therefore, we performed experiments with VASP, VASP ΔGAB or filamin in solution while filaments are tether using a low density of NEM-myosin. The growth behavior of such filaments was similar to what we observed when the side-binding protein was used as the tethering protein. These results are now discussed throughout the main text and included in Figures 1-3 and 5. In Figure 5, we have also plotted the persistent length for filaments at low tethering densities while having the side-binding proteins in solution. In these experiments, a significant change in persistent length is observable although slightly smaller than for experiments performed at high tethering protein densities. Hence, we can conclude that bending is due to binding of the side-binding proteins and not a surface-induced affect. We carried out Brownian dynamics simulations to explore the idea that subtle structural changes could give rise to changes in kinetics, which we observed in our estimates of the kinetic rates based on the different filament models. However, we acknowledge that there is little information regarding how the side-binding proteins modulate the filament structure and, more importantly, the connection is weak on how this structural alteration might translate into a kinetic effect. Therefore, we have now removed the entire section regarding the Brownian dynamics simulations from the manuscript. This is the same important issue that has been raised by Reviewer 1 and we agree with the reviewers that experiments with a low density of tethering molecules and a second binding molecule in solution would help to rule out torque-induced effects. Therefore, we have performed experiments with VASP, VASP ΔGAB or filamin in solution while filaments are tether using a low density of NEM-myosin. We observed a similar growth behavior of such filaments to that when the side-binding protein was used as a tether. These results are now discussed throughout the main text and included in Figure 3–figure supplements 1-3 and Figure 5. We apologize for the confusion on this important point and we have now clarified this in the text. Our pause-free elongation rates convoluted with observed pause rate (∼90%) would result in elongation rates (kon of ∼ 0.2 and koff ∼0.1) consistent with previously estimated rates using TIRF microscopy (Kuhn and Pollard, Biophys J, 2001, Table 1). The pause-free elongation rates agree with data obtained from EM data (Pollard, JCB, 1986) (misnamed “bulk” in the manuscript). EM data was obtained by measuring the length of individual filaments at various times points from 20 to 60 s using negative-stain electron microscopy (Pollard, JCB, 1986). We have noticed that pointed-end growth also occurs at the beginning of filament growth (Figure 4C) before going to a paused state. One possible explanation for this difference is that the “initial pointed-end growth” could originate from an unconstrained ATP-actin monomer-based elongation. The appearance of the paused state could originate from ATP hydrolysis, actin flattening and/or a non-elongating structure (Narita et al., EMBO J, 2010) at the pointed-end. The origin of the paused state and it possible relationship to nucleotide or structure is unclear at the moment and we are working towards elucidating the mechanism behind it. We have included this discussion in the main text (subsection headed “Intrinsic filament dynamics”). To ensure actin functionality is indeed a key issue with respect to protein labeling. We agree with the reviewer that, whenever possible, it is preferable to use a specific labeling strategy than stochastic labeling. Unfortunately, the use of the cysteine residue at position 376 for fluorophore attachment is problematic as the polymerizability is compromised (Kuhn and Pollard, Biophys J, 2001) and elongation rates are decreased with increasing amounts of labeled protein. In order to test for possible artifacts with stochastic labeling, we have previously characterized the functional properties of lysine atto-labeled actins where we used 1:1 dye:protein ratios for labeling (Crevenna et al., JBC, 2013), which leads to an average labeling of one fluorophore per protein. In Crevena et al., JBC, 2013, we carried out pyrene polymerization assays, TIRF elongation, EM and FCS experiments. Our results suggested that the lysine-labeled protein is fully functional. We have not observed (by mass spectrometry) a preference for lysine modification of the solvent exposed residues (data not shown). For TIRF assays, we mixed fully-functional labeled actin (Crevenna et al., JBC, 2013) with unlabeled actin to a final ratio of 2:1 unlabeled:labeled protein. We have now added the requested detailed information regarding the labeling procedure, etc., in the Material and methods. We have now included the model section as part of the main text and expanded the text to describe the model in more detail. The LC is dependent on the properties of the actin filament itself but is clearly modulated by the side-binding protein. The propagation length of the VASP ΔGAB construct is roughly 2 helical repeats, VASP is 4 helical repeats and the effects of α-actinin, filamin and NEM-myosin are on the order of 13 monomers, i.e. half a helical repeat. This could possibly implicate that the structure of the actin is important in determining the propagation length. However, as this is very speculative, we have decided not to discuss this in the current manuscript. To have an estimate of the propagation length, we proposed the simplest model necessary. Hence, we have two free parameters (an amplitude and the LC) and wished to avoid making more assumptions (e.g. fixing the amplitude). The results of our model yield the above range in LC values. However, the important point here is that altered kinetics parameters can be propagated along the actin filament in a side-binding protein dependent manner. As we mentioned to Reviewer 1, we carried out Brownian dynamics simulations to explore the idea that subtle structural changes could give rise to changes in kinetics, which we do observe in our estimates based on the different filament models. However, we do acknowledge that there is little information about how the side-binding proteins modulate the filament structure and, more importantly, the connection is weak on how this structural alteration might translate into a kinetic effect. Therefore, we have now removed the whole section regarding Brownian dynamics simulations from the manuscript. We have analyzed our data as a function of filament length. We observe the counter-clockwise growth for filaments of all lengths (see Author response image 1 below). In the main text (Figure 5C), the percentage of counter-clock growth has been estimated taking all lengths into consideration. That this result is independent of filament length has now been added to the main text lines (in the subsection “Structural effects of side-binding proteins on filaments”). We thank D Kovar for the Image J macros's to perform the filament analysis, J Faix for the DdVASP expression plasmid and J Dominguez for valuable discussions. This work was supported by the Max Planck Society and by grants from the Deutsche Forschungsgemeinschaft through the SFB 1035 (to OFL), the SPP 1464 (to RWS and DCL), the Excellent Clusters Nanosystems Initative Munich (NIM) and Center for Integrated Protein Science Munich (CIPSM), the Cells-in-Motion Cluster of Excellence (EXC1003 – CiM) of the University of Münster, a CONACYT-DAAD scholarship A/09/7253 (to MA) and the Ludwig-Maximilians-Universität München (via the LMUInnovativ BioImaging Network (BIN) and the Center for NanoScience (CeNS)). This research has also been supported (to KK) by the 2011/01/B/NZ1/00031 grant from the National Science Centre, Poland. © 2015, Crevenna et al. Siyu Serena Ding et al.